Ernst Stavro Blofeld with his beloved cat, as they appeared in You Only Live Twice. 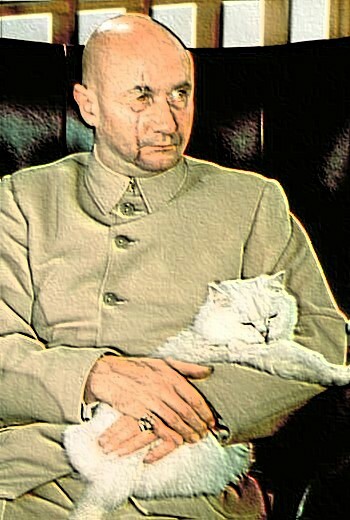 Blofeld is portrayed by Donald Pleasence. The identity of the cat is not known. Copyright MGM/United Artists. nykyinen 5. huhtikuuta 2007 kello 10.15 350 × 520 (59 KiB) Napoleon Ernst Stavro Blofeld with his beloved cat, as they appeared in ''You Only Live Twice''. Blofeld is portrayed by Donald Pleasence. The identity of the cat is not known. Copyright MGM/United Artists.